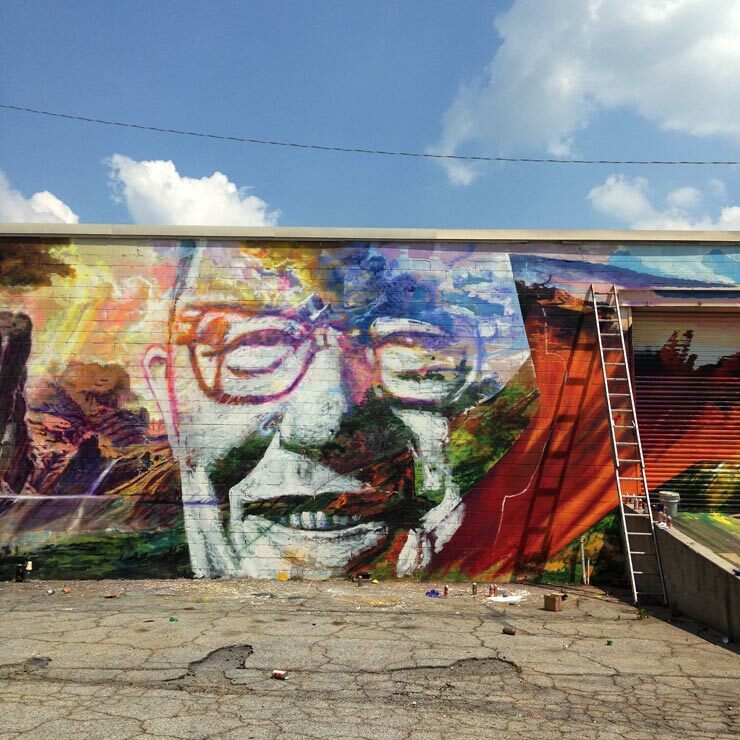 The traveling Street Artist and historian / student / observer / critic of urban planning, anthropology, people’s movements who goes by the moniker GAIA shares with us today some of the back stories for recent murals he has authored. When he posts on his Facebook page that he is looking for recommendations for reading about a certain city or culture where he will be soon visiting, you can have a degree of certainty that GAIA will soon be depicting what he learns with portraiture and dioramic imagery that illustrates what he has found. 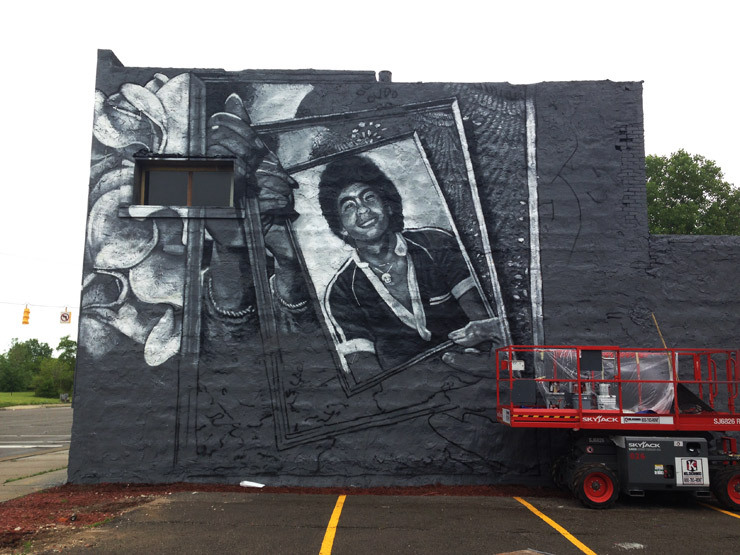 This fascination for self-education and public education through public artworks has roots in mural history that has persisted for decades in cities and neighborhoods around the world. 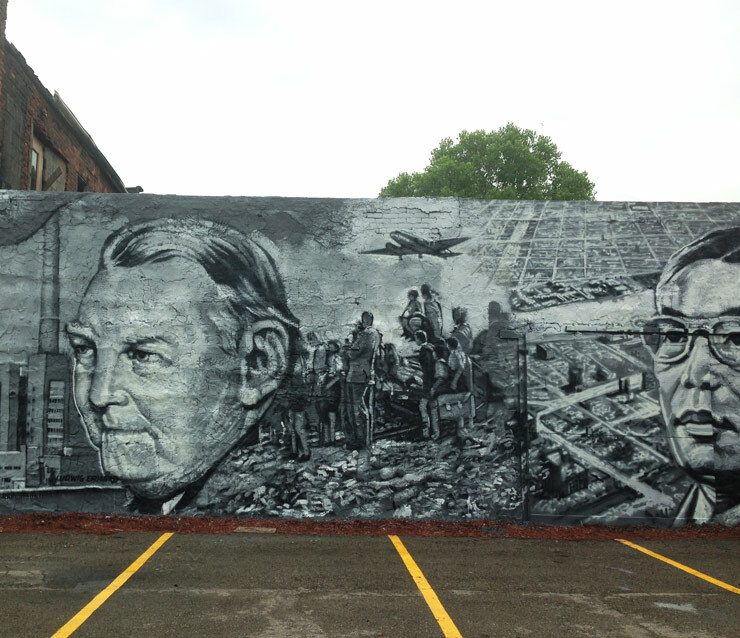 Typically public murals are stories told from a formal city or town historical perspective or come about from the distilled sentiment of a community to address or commemorate pivotal people and events that formed and molded the direction or DNA of a population. 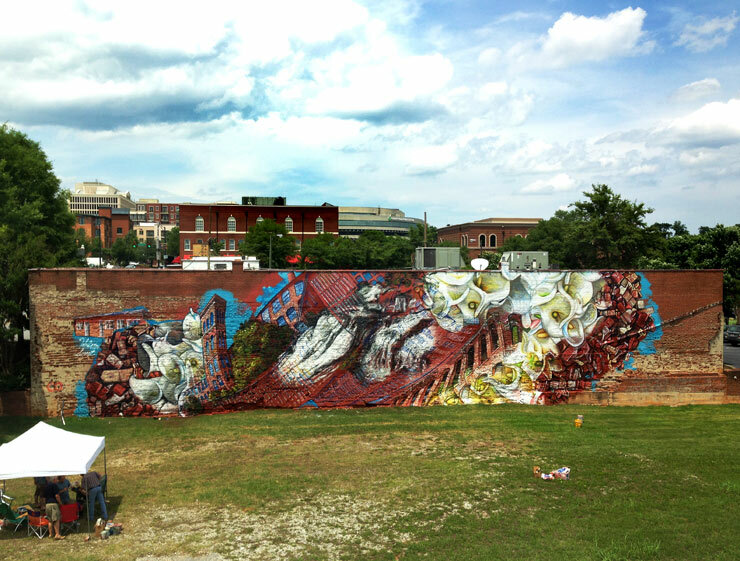 With Gaia’s personal study, criterion for selection, and style of storytelling one wonders if there is not a GAIA school of mural making that has been evolving over these last five years – one that already appears to have adherents and enthusiastic co-creators – and which reflects his focus on social movements, political machinations, industry, economic drivers, and anthropology. Here are recent examples of work by Gaia and collaborators in three American cities (although his work is not limited to just this continent) along with some explanatory text from the artist to help contextualize the stories and players evoked within them. 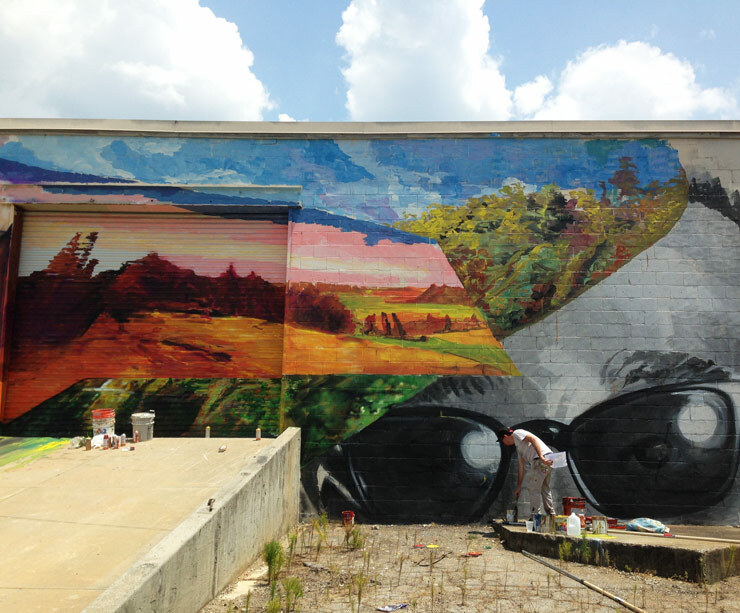 Part of #yearofaltruism, the mural features the warped images of four mills that have been repurposed or are slated for renovation and that flow through the Reedy River falls. 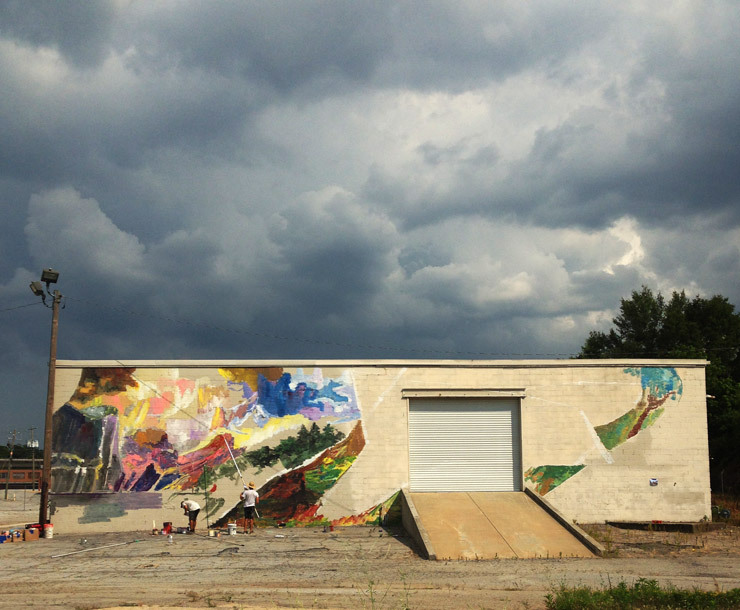 Previously sites of industry and working class employment that are now used for shopping, upper-income lofts, and entertainment culture, these mills are part of a local heritage that GAIA wanted to preserve. Gaia would like to thank The Year Of Altruism Foundation for including him in their programming and for inviting him to Greenville, with special thanks to Steve Cohen and Don Kliburg for orchestrating the project. 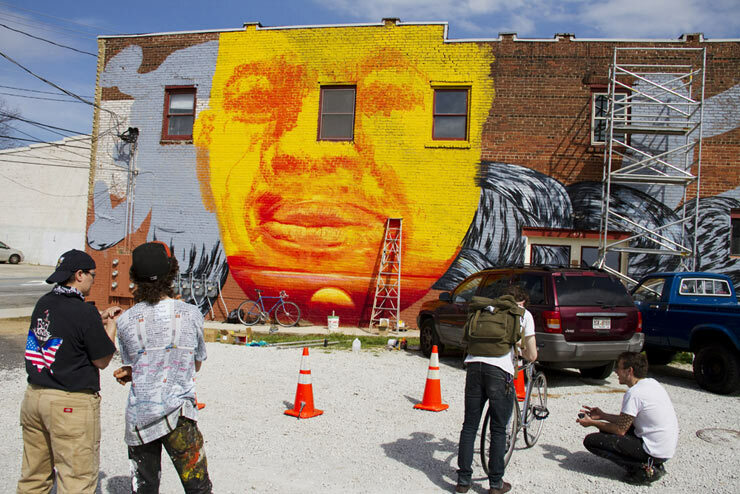 With that image as the central one, GAIA combines images of leaders whose careers directly or indirectly could be tied to that event, he says. 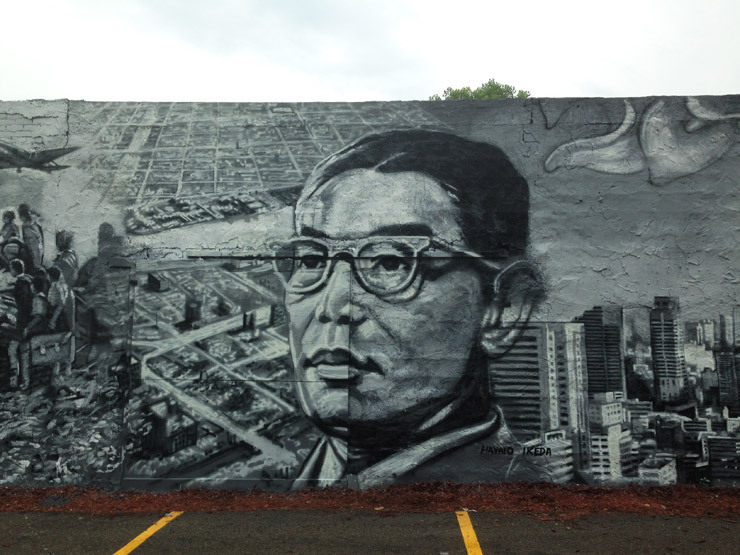 He describes the mural like this: “Painting post war economic miracles as a portrait of global competition that led to layoffs in Detroit and fueled the frustration and xenophobia behind Vincent Chin’s murder”. “Wirtschaftswunder” Ludwig Erhard was a German politician notable for his role in Germany’s robust post war recovery. Sun Yun-suan (Chinese: 孫運璿; pinyin: Sūn Yùnxuán; November 11, 1913 – February 15, 2006) was a Chinese engineer and politician. As minister of economic affairs from 1969 to 1978 and Premier of the Republic of China from 1978 to 1984, he was credited for overseeing the transformation of Taiwan from being a mainly agricultural economy to an export powerhouse. 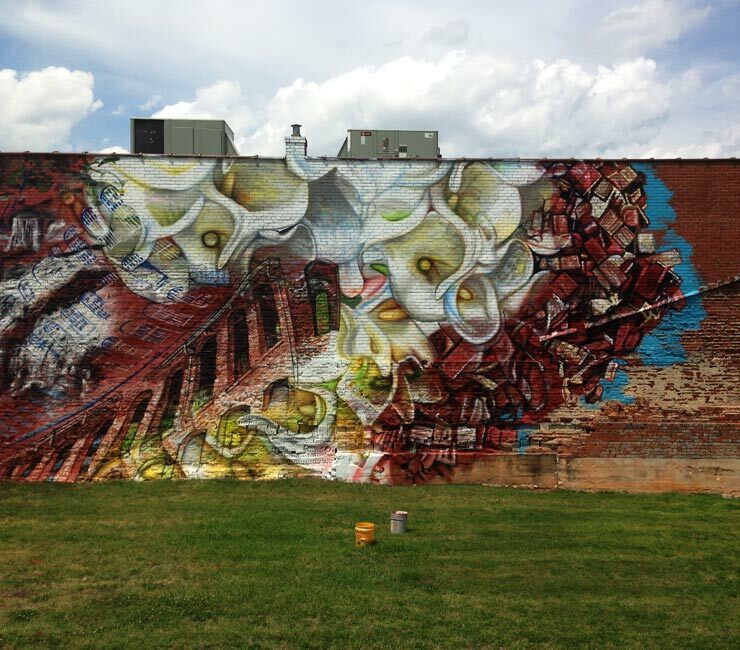 Gaia In Town: New Work is Large!